The Employment Contract in Transforming Labour Relations provides a world-wide analysis of the changing role of the contract of employment in modern societies. The central question in this book is whether the contract of employment still serves its traditional purpose in a period marked by the so-called `globalisation of the economy' with the concomitant calls for flexibility in and deregulation of the labour markets in capitalist countries. 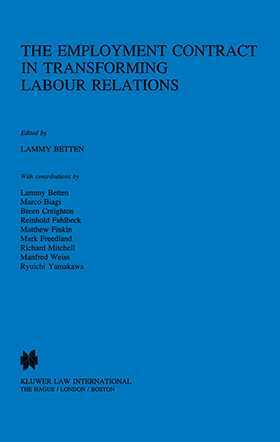 Highly regarded authors from a number of European countries, as well as Japan, Australia and the United States, have contributed to this exciting comparative exercise which provides vital reading for anyone interested in the restructuring which labour relations must undergo to meet the demands of a newly emerging (post) industrial society.